Each week, over 500 beaches are graded A to F based on bacteria analysis. Check back often for the latest grades...know before you go! 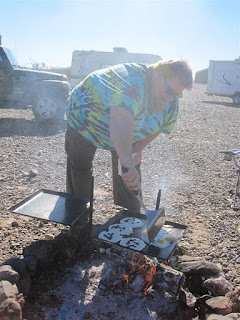 Camping can be a real summer vacation dollar-stretcher...here are some ideas shared by Pam Jasso Sigurdson from her Houston radio show that can come in handy wherever you are! Target Stores - pays for free museums and events across the country - go to target.com/community and click on "arts and culture" to find out what's happening near you. $.50 to $1 movies - during the summer, Regal and Cinemark offer one or two weekday matinee specials per week. At Apple Camp (in Apple retail stores) kids ages 8-12 learn how to make their own film using iMovie software. The 3-day workshop leads to a festival where campers can debut their flicks. 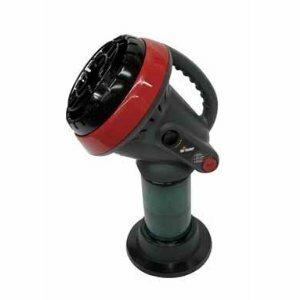 Truly portable and very handy if you do any camping where there could be a slight--or big--chill in the air. What's better than canoodling under stars? Not much. Add fresh air + campfire + a splash of champagne in our over-the-top goblets we picked up at the Madonna Inn on our way to a Pismo Beach TrailerLuv getaway and what have you got? A scene ripe for romance. No timetable, no TV, nowhere you "have" to be except wherever you are! Having the time and space to just enjoy each other's company without the regular distractions that plague home life is such a treat. Collecting shells, beach frisbee or even just stopping long enough to enjoy a stunning sunset can be so relaxing you may slide on into a romantic frame of mind without even planning it! My favorite suggestion is "the Right Attitude!" Whatever else you add to the mix, the right attitude will set you on the path to romance. Focus on each other, in the moment and let nature do the rest! An RV-sized asteroid? Does that include the slideouts? Got an extra $1.5 million laying around? 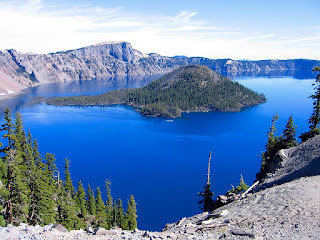 Wizard Island in Crater Lake graces the latest cover of AAA's Via magazine. 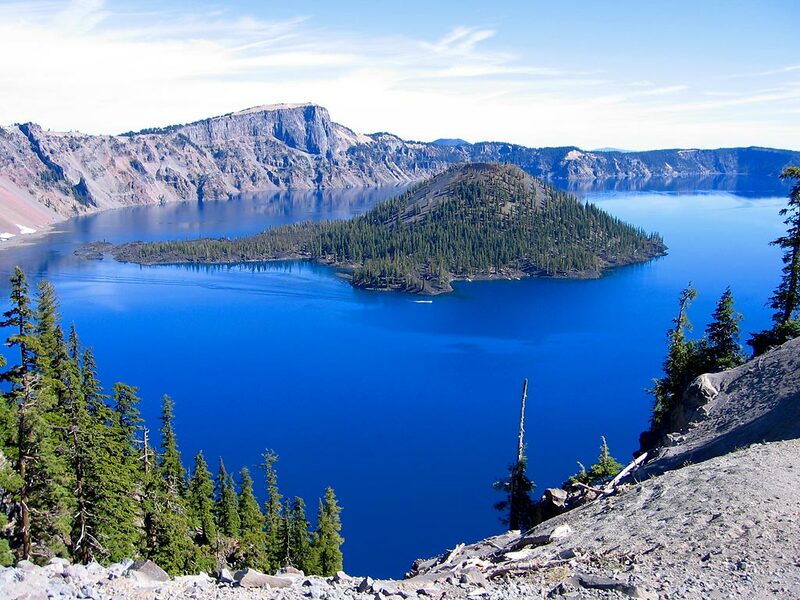 I've yet to camp in Oregon but really want to! 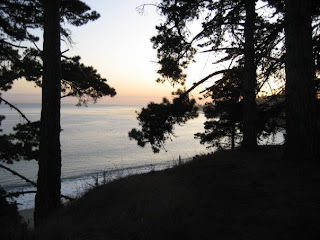 I've heard stories from fellow campers that Oregon campgrounds are generally pretty cool with swell sites and cheaper-than-California overnight rates. If you get there before I do, let me know! 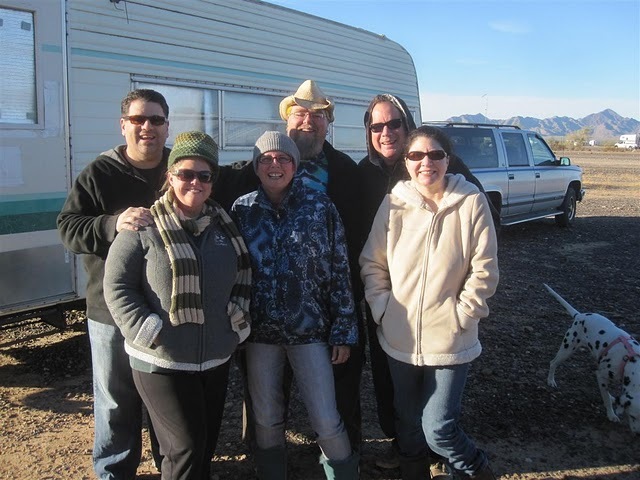 Meet-Up with Nu-Rvers in Quartzite for New Year's Eve 2010! Nu-Rver Kev and Tommy show off their new flea-market-find-skull-caps...honestly, it was so cold, they would have worn sparkle pony caps. Luckily, they found the skulls first. trailerluv: Hello Mercey Hot Springs! When you arrive at Mercey Hot Springs, check in first at the little chapel. 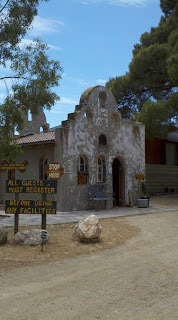 That's where you get the lowdown on the campsite policies and the hot springs. 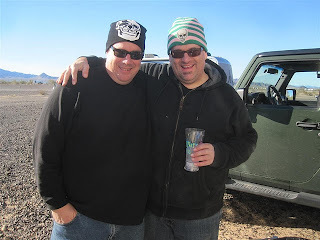 One of the most fun things about camping is the friendly people you meet. 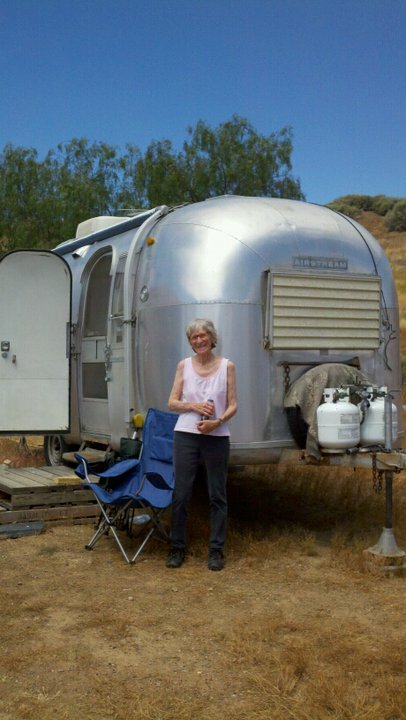 Below, fellow camper Pat poses in front of her lovely vintage Airstream. 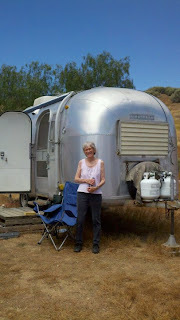 She invited us in for a chat and to have a look around her little trailer gem. Tom would love to have an Airstream someday. I'm glad he didn't try to arm-wrestle Pat for hers!